I’ve been bitten by a bug. My non-Australian readers are probably envisioning a parade of deadly, venomous Australian critters but it’s nothing like that. I’ve been bitten by the bakery bug. Recently, I turned on the television, tired of the normal insipid televisual offering, and eager to find something different. Until that point I had deliberately avoided the Lifestyle channels, you know, the next top models, the next fashion designers, the next singing sensations … ad nauseum. Don’t get me started on Tori, Kardashian and big gypsy weddings! So, against my natural instincts, I turned onto a Lifestyle channel and found myself on a program called, The Great British Bakeoff. The very name conjured visions of elderly ladies floured to the elbows churning out cream sponges. I love this show! I’m hooked on this show! I won’t go into all the details of the show, suffice to say that it is a reality show where contestants bake up a storm of signature and technical products and are judged by Paul Hollywood and Mary Berry – bakers extraordinaire! I introduced Stuart to the show, and now we’re both hooked. So much so, that two nights ago I rushed home from work and produced a swiss roll, complete with peach and mango custard filling and rolled in coconut! Yep, I have been bitten badly. So badly, that I hopped onto Booktopia and bought me a couple of cook books. One of them was the official book from the television series, The Great British Bakeoff: How to Bake. The other was Paul Hollywood’s How To Bake. 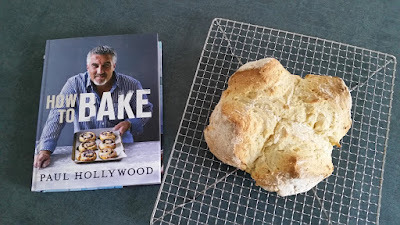 I haven’t looked at the first one yet but let me tell you about Paul Hollywood's book. OMG! I love it! I can honestly say that I have never sat down and read a cook book before. I don’t tend to even buy them, yet to not only buy it, but to read it! That’s unheard of. I received my book in the mail yesterday. I read the Foreword, Introduction and Basics chapters this morning over coffee and immediately set to work writing a list of things I was going to need: new baking dish, baking stone, something called a baker’s peel and a proving bowl … Paul says I don’t have to buy all this stuff, but I will because this is my newest passion. Oh the bread I’m going to bake! I can’t wait. And once I get into the other book I’ll be churning out cakes, biscuits … you name it. I will no doubt end up making a right pest out of myself by baking more than Stu and I can possibly consume. So why am I telling you all this? Simply because I am excited. I’ve always enjoyed baking – I love baking cakes and bickies, but Stu asked me to stop because he couldn’t resist them and was eating too much. But there’ll be no stopping me this time. Although I was originally inspired by the television show, these books are simply beautiful. I can’t speak highly enough of Paul Hollywood’s book. If you’re into baking you could do worse than getting your hands on a copy. Even if you’re not into baking, if you flick through this beautiful book, you soon will be! Just try to resist – I dare you! Until next week, in the words of The Great British Bakeoff’s Sue and Mel, ready … set … BAKE! Soda Bread - my first loaf a success. I wonder what Paul would make of it!! So pleased to read you've discovered Bake-Off, as we call it here in the UK. The fifth series has just ended and it has become a national institution - although Mary Berry has been a national institution for many decades before that! Do look to see if the Great British Bake Off: An Extra Slice is also available to view in Oz. Hosted by Jo Brand it's a witty follow-up to each episode, where we get to meet the person who has just left the tent, and to see hilarious photos of bakes that the viewing public have made at home. I know, it sounds crazy that an entire nation is hooked on a TV programme about baking! But for the final on Wednesday one quarter of the population tuned in to see who would be crowned 2015 champion! I'm already looking forward to next year's! Hi Janice, thanks for you comment. Funnily, I have just this minute taken my very first batch of scones out of the oven. Paul's book says to let them cool but I couldn't wait for that!! Love the show and can't wait for the next season to get to Australia.